Looks like Saif Ali Khan already has a name in mind for his soon-to-be born baby and it is a combination of both his and Kareena's names. Having a name for their baby by combining both the mother's and father's name has become a new trend in Bollywood couples. It can be that Saif and Kareena also follow suit just like Shahid and Mira named their daughter Misha and Rani Mukherji and Aditya Chopra named their little princess Adira. If reports are to be believed, Saif has already thought of a name for his little bundle of joy on the same lines. "I love you more pregnant. I think you should just continuously being pregnant," said Kareena. She also added that Saif finds their name "Saifeena" very funny and perhaps he might chose the same name for his baby. "He finds it really funny. He says we’ll name our child Saifeena," said Kareena in the same video. The couple are also planning for a baby moon in Dubai before Kareena gets busy with motherhood and has no time for Saif. 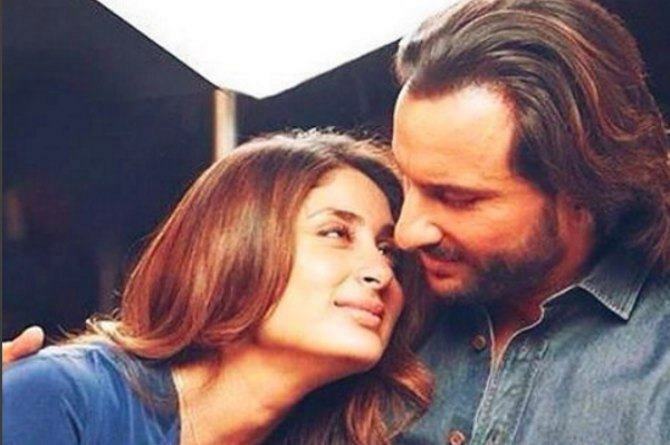 According to reports, hubby Saif has big plan for his begum Kareena which would include a visit to the beach, an outing at the spa and of course some much-needed retail therapy to make the to-be mum happy. The baby moon is being scheduled for mid-October. Meanwhile, Kareena spoke to a leading national daily and said that she is not at all nervous about being a mother. Continue reading on the next page to know why Kareena is not nervous to be a mother soon! "I am very excited. I am not nervous at all (smiles). This is something that every woman looks forward to in her life. It will be a life-altering experience for my family and friends. The feeling can’t be put into words. It is an intimate and personal thing for me. Only once it happens, will the reality sink in," said a confident Kareena. Kareena also said that she is not too much focussing on the kind of parent she wants to be and what parenting style to follow, even though her sister Karisma is already a mother and is guiding her day-in and day-out. "Not many people understand that being a mother is a personal experience. You can’t compare two parents. Five hundred people are giving me 500 pieces of advice. I am listening to them from one ear, and taking out their advice from the other (laughs). I will form my own rules, because no two kids are similar," she said. 1. Be confident: Having a baby for the first time can freak new mothers and they might do something just out of fear and nervousness. However, that's not how it should be. Just like Kareena new mothers should be confident of their pregnancy and motherhood and not be bothered by what others do or say. 2. Listen to advice but follow your heart: Indian people love to give advice and you can be barged with a lot of unwarranted advice during pregnancy and after that when you become a new mother. While you must liten to every bit of advice, don't follow them randomly. Try to analyse it carefully and follow what your heart says. 3. Don't be nervous: Pregnancy and motherhood can be a nerve-wrecking experience, but that does not mean that you get the jitters each time something happens to you. As a to-be mother you should be able to deal with every problem confidently and also be in-charge of yourself and your baby. Also Read: Birthday girl Kareena Kapoor's pregnancy cravings will surprise you!